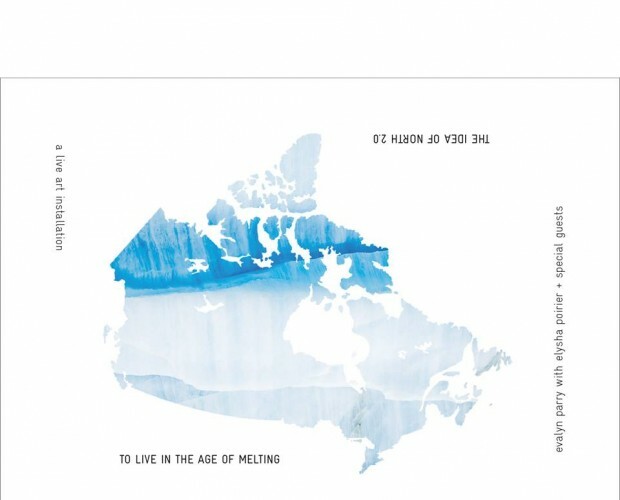 For my final SummerWorks production, I returned to Studio C of the Pia Bouman School for Creative Movement to see the closing night performance of Evalyn Parry’s To Live in the Age of Melting: The Idea of North 2.0. You can read the post about my visit to the installation here. The table of objects and remembrances of visitors’ experiences of the North has been moved to the side of the space to accommodate chairs for an audience. The stage is set against the back wall, designed to look like a wall of ice. 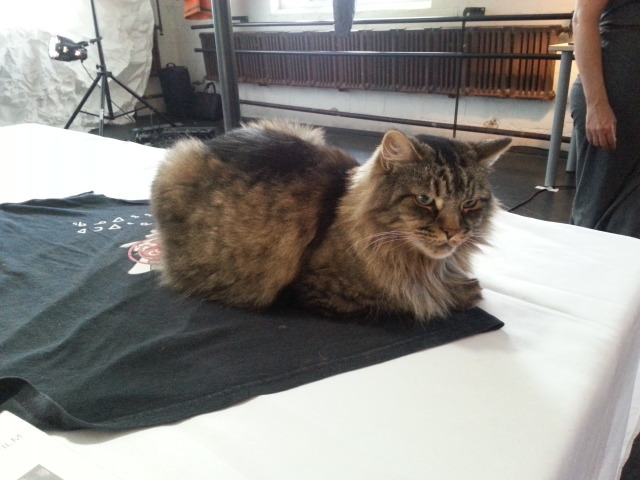 Frank, the studio cat, lounges upstage right and eventually wanders about during the course of Parry’s performance. This is his space, after all, so it wasn’t much of a surprise that he inserted himself into the show. Weaving history, songs, personal anecdotes and images of her trip to Greenland with Students on Ice, along with some visitor interview excerpts recorded during the installation’s residency at SummerWorks, Parry takes us from the Franklin expedition to the present day, winding through exploration, a brief history of the Dominion’s early and shameful relationship with the Inuit, to her own personal thoughts and experiences of the North. The performance has a kitchen party quality to it, especially when we are invited to turn our chairs around to face the map, with Parry’s soundscaping and singing continuing throughout, in a crystal clear and soothing, mantra-like celtic folk style. Parry’s father David, who was a folk singer and member of The Friends of Fiddlers Green, also features prominently in the performance – and To Live in the Age of Melting may be as much an homage to him as it is to the landscape. History, geography, ecology, politics, art and culture merge in this moving and enlightening performance. And although the SummerWorks installation and performance is now over, this is just the beginning of Parry’s exploration. She plans to continue honing this work, and will go on to conduct a similar examination of Northern views of the South. Evalyn Parry’s To Live in an Age of Melting: The Idea of North 2.0 is the beginnings of a beautiful ode to the North. Keep an eye out for Evalyn Parry and To Live in an Age of Melting: The Idea of North 2.0 – and its continuing evolution and addition of Northerners’ perspectives. It was a chillier than usual August night in Toronto last night – and I found myself purchasing hot chocolate and wishing I’d brought a jacket, which felt odd – but it was what it was. To be honest, I’ve really been enjoying this cooler summer. I had some time before my next show, so it seemed like the perfect opportunity to stop by Studio C of the Pia Bouman School for Creative Movement to check out Evalyn Parry’s work in progress – with fellow creators/performers Elysha Poirier and Laakkaluk Bathory Williams – for OutSpoke Productions’ To Live in the Age of Melting: The Idea of North 2.0, part of this year’s SummerWorks Live Art Series. The first phase of To Live in the Age of Melting is part installation, part viewer participation, as Parry collects objects and images from patrons of their experiences of the North, and asks people if they’d like to be interviewed about their thoughts and perceptions of the North. Featured prominently when you first enter the space is a giant map of Canada. Visitors are invited to share how far north they’ve been – and Parry’s assistants (in my case last night, SummerWorks volunteer Pauline and Aidan) will plot your destination on the map, from start to finish, using pins and colour-coded string/thread. In my case, it’s the Greater Toronto Hamilton Area (GTHA), Ontario to North Bay, Ontario; my thread is black, as I took the trip by car (with my family when I was around 10-12 years old, when my mother’s sister and her family lived in Callendar, ON). I also took the opportunity to be interviewed. Since I’m not down with spoilers, I won’t mention the specific questions Parry asked me, but I will say they were extremely thought-provoking and interesting. A reminder of relative perspective – when I think of “North,” in terms of perceived geography, I think of it as starting around North Bay – but that’s the farthest I’ve been, so that will be different for someone who’s been to NWT, Yukon, Nunavut or Iqaluit. It was a pleasure chatting with Parry, and I look forward to seeing the work come together in the performance this weekend. The assembled personal artifacts and interviews will contribute to the final performance piece, which will also be a work in progress (as the installation and viewer contributions continue daily from 5:00 – 8:00 p.m.) – with performances running Aug 15-17 at 9 p.m. In the meantime, check out NOW Magazine’s piece by Glenn Sumi, where he speaks with Parry about, among other things, her two SummerWorks projects: directing Shaista Latif’s Graceful Rebellions and the genesis of her work on To Live in the Age of Melting. Hey all – A quick second post to follow up the slide show of Lisa Anita Wegner’s opening night of her STARDUST: Life on Jupiter? Transformation event at The Black Cat Gallery: Wegner’s time lapse video of the evening’s metamorphosis, including GoPro cam footage of stylist Wanda MacRae’s perspective. 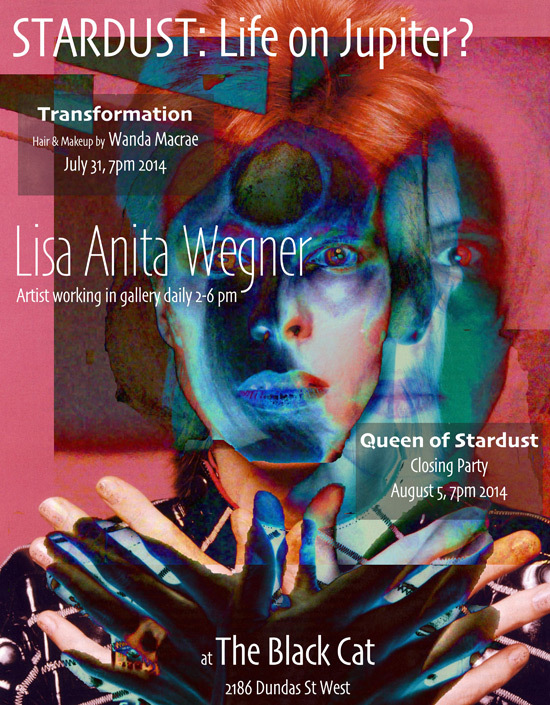 I dropped by The Black Cat Gallery (2186 Dundas Street West) last night for the Transformation at Lisa Anita Wegner’s opening of STARDUST: Life on Jupiter?, on until August 6 (no worries about what it says on the poster – I confirmed the date with Wegner). A one-of-a-kind event, Stardust: Life On Jupiter? incorporates the focus on re-birth, redemption, transformation, and search for truth through the adoption of personae that has been a key part of Lisa Anita Wegner’s art practice in her journey to reclaim her life from the personal darkness into which she was plunged six years ago. Friends, family and Ziggy fans alike hung out together in an intimate, casual atmosphere, sharing a drink and chatting as Wegner’s transformation happened in the middle of the room as Ziggy videos played on the wall behind her. The hair colour came two days earlier, the eyebrow waxing that afternoon (along with a mani-pedi). Stylist Wanda MacRae (who freelances as a makeup artist and colourist, and just got a new gig at Parlour Salon at their Queen Street East location) used a straight razor to shape Wegner’s hair into a Ziggy mullet, then hair spraying to get the volume up front on top. After a break, Wegner returned to the chair, her white lab coat now covering her costume, so Wanda could do the makeup. Hair and makeup were followed by ceremonial milk consumption and a cosmetic dusting with white face powder – a nod to Ziggy’s diet of milk and cocaine. Then, the reveal. It’s quite remarkable how much like Ziggy she is. Confetti and noise makers announced the emergence from the transformative process. Wegner will be at The Black Cat Gallery every day (from 2 – 6 p.m.) for the duration of the exhibit, as she continues to explore the project live and in real-time. The process will culminate in a closing night event (Aug 6 at 7 p.m.), featuring a special, one night only “Stardusted” version of Wegner’s Queen of the Parade installation (a collaborative work with fashion designer Vanessa Lee Wishart, which appeared during Toronto’s Nuit Blanche 2013 and ArtRageous in Motion). In the meantime, you can also find Wegner on Facebook, Twitter and on her YouTube channel. And check out the first interview I did with her. Hey kids! For all y’all who are coming back to your regularly scheduled programming after the long weekend: hope you had a good one. Can you believe we’re well into the first week of August already? Holy moly! StageWorks Toronto’s production of Parade runs Aug 8 – 18 at the George Ignatieff Theatre. SummerWorks gets up and running Aug 8 – 18 at various venues. I’ve got my eye on: Delicacy, Eating Pomegranates Naked and Utopia. The August edition of The Beautiful and the Damned on Thurs, Aug 8 at Q Space from 7 – 9:30 p.m., hosted by Lizzie Violet, and featuring Brenda Clews, Adam Abbas and Andrea Matchett, and a whole lotta talented open mic performers. Dead celeb of the month is Janis Joplin. This will be TB&TD’s last show at Q Space – new location TBD. Songwriters Circle of Jerks is also up on Thurs, Aug 8 at Free Times Café at 8:30 p.m., featuring guest performer blueVenus. More music at Free Times Café on Sat, Aug 10 at 8:30 p.m. with Craig Robertson, Heather Hill and Tania Joy. The monthly cabaret/open mic extravaganza Lizzie Violet’s Cabaret Noir says goodbye to Q Space on Sun, Aug 11 7 – 10 p.m., with feature performers sol knots, Andraya and Tania Joy, as well as some amazing open mic talent. Cabaret Noir heads to a new venue in September – new location TBA during Sunday night’s show.